Ninth Letter is proud to publish Marsha Koretzky's short story, a fictional essay with a fictional introduction that serves as a sly tribute to Kurt Vonnegut (yes, a tribute, despite its unlikely title), on the occasion of the opening this fall of the Kurt Vonnegut Memorial Library in Indianapolis, Indiana. Vonnegut was born and raised in Indianapolis, and though he spent a great deal of his later life in Massachusetts and New York, it is more than fitting that the organizers of the library are bringing him back home to his Midwestern roots in spirit, so to speak. Marsha Koretzky is a long-time reader and admirer of Kurt Vonnegut's work, and she once, she claims with pride, met Vonnegut briefly at the premiere of a requiem he wrote the libretto for, "Stones, Time, and Elements." Marsha says, "What I remember most is how tall KV was." She also says that the idea of her name appearing in the same paragraph as Vonnegut's in this introduction "gave me goosebumps, actual goosebumps." Koretzky, a graduate of the Vermont College of the Arts MFA Program, has published her other fiction recently in Calyx, Dos Passos Review, and Westview. The Kurt Vonnegut Memorial Library will host a public open house "sneak peek" of the Vonnegut Library's development on November 12th from 6-8 p.m. at the Emelie Building, 340 N. Senate Ave., Indianapolis (the former site of the Indianapolis Museum of Contemporary Art). There will be several exhibits ready to view, including an art gallery featuring Vonnegut art, a reading room, a gift shop, and several exhibits in a museum area that focus on Vonnegut's life and works. We hope everyone in the area will attend this event, in order to celebrate the legacy of one of America's greatest writers. For more information, consult The Kurt Vonnegut Memorial Library website. My name is Meghan O'Hare, and I am the daughter of Bernard V. and Mary K. O'Hare. If you're reading this, you are probably a Kurt Vonnegut fan and so might already know--or think you know--all about my mom and dad. Mr. Vonnegut was my dad's best friend from his army days in World War II, and my dad was Mr. Vonnegut's friend, too. They both liked Mr. Derby, who was shot for stealing a teapot after the firebombing in Dresden, and they both hated William Joyce, who was a Nazi propagandist in Germany during the war. As you probably know, Mr. Vonnegut dedicated his most famous book, Slaughterhouse-Five or the Children's Crusade: A Duty-Dance With Death, to my mother, Mary O'Hare. Mr. Vonnegut truly did come to see my dad while he was trying to write the book, and my mom really did start slamming the kitchen cabinets around when she heard what Mr. Vonnegut was up to. He was a sweet man, Mr. Vonnegut, and he didn't want to make the war sound like a good thing for anybody. My parents are both dead now. My mother died back in 1999, and now my dad's gone, too. Me, I was their happy accident. My mother thought she was past getting pregnant when I showed up and surprised everybody. I was living my own life by the time Dad got sick, so he was pretty much on his own. He had a brain tumor, and I didn't even know it. I didn't check up on him as often as I should have, and that's something I'll have to live with. Also, I made a promise to my father before he died. I wish I hadn't, but I did, and now I'm keeping it. My dad was a lawyer. He used to be the District Attorney, then he changed jobs and only represented children. He was the one who went to court for kids who had been abused or neglected by their parents. Sometimes he represented kids when their parents were getting divorced. You'd be amazed at how many times Dad had to yell at those people who had forgotten all about their kids while they fought over dishes and big screen TVs. Dad also had clients who wouldn't go to school, or ran away from home. Some kids had parents who sent them out to prostitute themselves, or sell drugs, or shoplift DVDs and lingerie. To those kids Dad had to say, "The policeman is not your friend." He hated that, even though he always said the one thing he learned in the war was not to trust the government. I'd get jealous of those kids sometimes. Even when they were bad, those kids, when they were nasty and didn't respect anybody, my dad always had time for them. And patience. He never told them, no backtalk. He never seemed to notice how they sassed him, never assumed the worst of them. I asked him once, Why kids? And he said because they're the most disenfranchised people in this country. Also because he wanted to show them that someone would listen to whatever they wanted to say and would be kind and respectful. Maybe then they'd be kind and respectful to someone else. He was always hoping he could catch one before the kid was lost forever. That's the kind of guy my dad is. Sometimes when he had a bad case, one he knew he couldn't win, Dad would tell the judge about the Children's Crusade. Maybe that's where Mr. Vonnegut got the idea for the title of his book about babies fighting in a war because the adults who had all the power told the babies it was the right and good thing to do. Or maybe Mr. Vonnegut really did have that conversation with my mom. I don't know, but I do know Mom thought a lot about how bad wars and killing were. She didn't know how anyone could do it, kill somebody and then go home and get married and make babies that maybe would have to go to war. She slept next to my dad, after all, and had to hear him crying in his sleep about the things he did when he was a baby killing babies. So after my dad went to war, he came home and got a job and raised a family. He did the crossword puzzle. Read the newspaper. A regular guy. And then, the day he got the call saying Mr. Vonnegut took a bad fall and it wasn't looking good, I guess Dad shut himself up in his study and started talking into the tape recorder he used to dictate motions and letters and such to his secretary. He never did learn how to type. When Dad phoned to tell me about Mr. Vonnegut, his voice was strange, and he kept repeating himself. I knew he was getting up there in years, but it worried me, how scared and confused he sounded. I went out to see him, and he let me in, but then he went right back into his study. I could hear him through the closed door, talking to himself, saying how it just figured Mr. Vonnegut's body was manufacturing bad chemicals that unbalanced his mind. That's from Breakfast of Champions. It makes me so sad now because all the while my dad was complaining about what Mr. Vonnegut's body was doing, Dad's own body was making a tumor that was unbalancing his mind. And we didn't even know. We didn't know. By the time I realized I was going to have to stick around, Dad was staying in his study all day and all night, talking into that recorder. The tumor must have made him really mad. It also made him think he was a literary critic, even though he didn't know a thing about literary criticism. He only came out to bang things around in the kitchen, like my mom did that day so long ago. Then he'd grab a bottle of scotch and go back in. A lot of people will want to know if my dad was some kind of a nut and also a bad guy like Mr. Vonnegut made him out to be in Mother Night. That's the book about William Joyce. Only in the book, Mr. Vonnegut calls his Nazi propagandist Howard W. Campbell, and he's actually a spy for the good-guy Americans. So all the time while he's saying the most awful things about the Jews and so on, what he's really doing is sending secret coded messages to the good guys and helping them win the war. The problem is, he's still saying the awful things and, like Mr. Vonnegut says, "We are what we pretend to be, so we must be careful what we pretend to be." Well anyway, in the book, there's a soldier named Bernard B. O'Hare who arrests Howard W. Campbell. And I think he's the villain of the story even though he's only a minor character. He's so full of hate for the Nazis and all the terrible things they did that he becomes just like them. He beats Howard W. Campbell up. He says horrible things. I wish my dad could have seen how important Bernard B. O'Hare is. Bernard B. O'Hare is the one who makes sure we get it, that the real war is the one against the zealotry and hatred that can take over every one of us, even the people who get called heroes because we think they are saving the world from bigotry and evil. Dad was so mad when Mr. Vonnegut did that, made him into a character that should've been the hero, but wasn't. I thought they'd worked it out. I guess maybe Dad got angry all over again when that tumor shut off the oxygen to his brain. Mr. Vonnegut talked about my dad a lot and put him into a lot of his books. 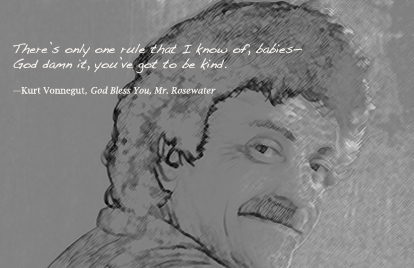 Sometimes he was Dad, and sometimes he was just a character Mr. Vonnegut made up. So what I would say to any of you who are wondering is this: My dad was what people called a real character, which always made us laugh because it was so literally true owing to his association with a famous fiction writer. He could also get pretty obnoxious. But he was a good man. And he definitely wasn't crazy. At least not until the brain tumor. My dad said I couldn't listen to the tape he made until after he was dead. He made me promise, though, to get it transcribed and published. Like I said before, now that I know what he said on that tape, I wish I hadn't said yes. It may not seem so bad to you, his going on and on about his old war buddy, but listen: My dad was smart and sweet and kind. He was one of the good guys. I hate that the last words people will have from him will be bitter, especially when that's not who Bernard V. O'Hare was; it's not what he and Mr. Vonnegut were with each other. It's sadness talking, sadness and loneliness you can't see, but I can hear and will always hear and can't ever fix. I can't vouch for the truth of any of the stories my dad put in here. They could have happened, though. I think it was supposed to be a eulogy, this thing. I think he thought he was going to say nice things. But that's not what it ended up being. Dad stayed up for three days—I could hear him pacing around and mumbling all night. He didn't sleep, but he drank an awful lot. Here's what I think happened to my dad: His old friend and army buddy, Kurt Vonnegut, died. He got good and mad about that and somehow made all this Mr. Vonnegut's fault. Because the fact is, my dad loved Mr. Vonnegut. He did. I think maybe they were the real duprass--after all, they died within a few days of each other. After Dad died, I brought this tape over to his ancient secretary, Joanie, who has arthritis and carpal tunnel syndrome from typing out all my dad's dreams of justice. Her eyes were all red, and she kept blowing her nose, but she took the tape in her spotted hands. I asked her to make a transcript of Dad's words. "Anything I can do, dear. You know I loved that man," she said, and then we both cried a little. Joanie dabbed at her old eyes with a dainty lace handkerchief that I could see she'd ironed. I made snorting noises and wiped at my nose with the back of my hand. It's funny how whenever I think of my dad, I go right back to being a little kid. Especially after I spent all those years trying to prove what an adult I was. It's like I'm Billy Pilgrim in Slaughterhouse-Five. Unstuck in time. My dad's old secretary, who would've marched herself across the desert, walker and all, if he'd asked her to, must have been surprised when she put those little earplugs in her ears and pressed play. So here is what Joanie put on the disc she sent back to me with a little note, the ink blurry from where it got wet. I didn't do much editing, just left out those sad little places where Dad's voice must've trailed off, and Joanie typed "inaudible." I know he doesn't sound like a lawyer. He sounds more like a man who has a brain tumor, but still has enough synapses snapping to be sad and angry that his friend died. I think if Dad had lived, he would have fixed it up. I wish I could do it for him, but I made a promise. Besides, he was my father and this is what he said. Some places, though, I just had to stick in my two cents. You'll see when you read it. I didn't do a lot of that, though, because, unlike how he loved to hear from his clients, my dad didn't like it so much when his own kids back-talked. I can still hear him going on and on about that and how different things were in his day. It drove me crazy when he did it, but now I'd take one of those lectures anytime.